A few weeks later, sitting in her tidy office on the eighth floor of the Sackler Center, she elaborated. “I finished graduate school in 1973—there was no biotech industry then,” Rosenberg said. “Graduate school was about a career in academia, and that’s what I wanted.” But facing limited faculty positions and slashed research funding, today’s young scientists might head to jobs in the pharmaceutical industry, life-sciences consulting or patent law. And universities must continually evolve, she said, to prep students for wherever their careers take them. Rosenberg has been doing that since the day she joined the Tufts University faculty in 1977. She was dedicated to advancing graduate education and fundamental science, first as a mentor for dozens in her thriving lab, then as the diversity-boosting dean of the Sackler School, the vice dean of research at the School of Medicine and as a leader on several national boards and task forces. Indeed, whether she was hosting a Ph.D. for a home-cooked meal or chairing the American Association of Medical College’s Graduate Research Education and Training group, Rosenberg always put students first. “Naomi’s deep commitment to educating the next generation of scientists was a constant thread in her personal and professional life,” said Dr. Harris Berman, dean of the medical school. It’s a refrain you’ll hear often from those who know her best. fascinated by the fact that these tiny organisms could cause such incredible disease,” Rosenberg said. Over 13 years as dean, Rosenberg encouraged the Sackler faculty to appoint chemistry, biology and biomedical engineering teaching staff from the Medford/Somerville campus, providing broader multidisciplinary training for students. She also supported faculty initiatives around diversity, including Building Diversity in Biomedical Sciences, a 10-week summer session, and the Post-Baccalaureate Research Program, which offers lab experience and mentorship for minority students who hope to go on to a Ph.D. The closer the school reflects our country’s population, “the better off we are and the more ideas we’ll have,” Rosenberg said. Another way she is looking to the future is with the Naomi Rosenberg, Ph.D., and Morton B. Rosenberg, D.M.D., D74, Fellowship. She and her husband—a professor emeritus at the School of Dental Medicine and a professor at the School of Medicine—established the fellowship to promote discovery-based science. (The first recipient, Danish Saleh, M19, SK19, researched the body’s inflammatory response to infection or tissue injury in the lab of his doctoral adviser, Alexei Degterev. The fellowship covered Saleh’s stipend for a year, which freed up money for necessary research tools and led to the publication of their findings.) Rosenberg has also agreed to stay on as a senior adviser to the interim director of the Human Nutrition Research Center on Aging at Tufts. Closer to home, Rosenberg and her husband—who have been teaching at Tufts for almost 85 years combined—raised their daughter, Jessie, a 33-year-old attorney, and 31-year-old son, Ethan, who works in health-care marketing. “She has been an outstanding mother,” Mort said. In retirement, the couple plans to travel around Asia and spend plenty of time with family—especially their newborn grandson. Rosenberg never felt like she was treated differently because of her gender, but colleagues and former students say she’s an inspiration for women in science. “Her students and others who weren’t even in her lab saw in her someone who could do it all,” Lange said. Of course, it helped that Rosenberg was routinely at her desk (or lab bench) before 6:30 a.m. throughout her decades at Tufts. 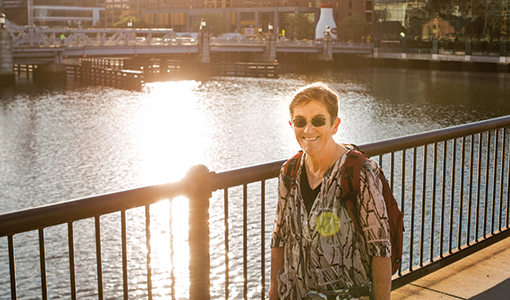 In recent years, she walked to work from her home in Boston’s Fort Point neighborhood—well into her day as the rest of the city was just waking up. —Lalita Ramakrishnan, SK90, professor of immunology and infectious diseases at the University of Cambridge. —Caleb Lee, M08, SK08, associate medical director of global oncology R&D at Daiichi Sankyo, Inc.
—Alan N. Engelman, E81, EG85, SK90, professor of medicine at Harvard Medical School. —Leslie Schiff, SK86, professor in the Department of Microbiology and Immunology and associate dean at the University of Minnesota.